DETROIT, MI – Don’t expect fame to change Rodriguez, a 70-year-old partially-blind folk singer from Detroit who is the star of a documentary film nominated for an Oscar. The focus of the “Searching for Sugar Man” film is expected to stay put in a Detroit home in the city’s Woodbridge neighborhood he bought for $50 back in 1976 during a federal government land auction. That’s the word from Konny Rodriguez, his second wife, who had a daughter with him and has been married to him since 1984.
via Wife of Oscar-nominated ‘Searching for Sugar Man’ star Rodriguez says he’ll stay in $50 Detroit home | MLive.com. WISE MOVE!! Any improvemnt made on a $50 home would be a GREAT investment!! Also, Home is where the heart is. Rodriguez you are who you are and Loved for exactly that…. This is in truth a man of substance. I believe there is one true God,who sees his heart,who will remember him, I wish I could of met you. Thank you, Great Provider, and to everyone and all their great struggles for bringing this man and his music into my home……. into my heart. It is as if I have been waiting for you. You have forever touched me. Thank you my dear man, Rodriquez. This music, these beautiful pure albums are part of my soul now. I have been forever touched . Thank you Sixto for the pleasure of your music. My husband and I went to bed crying last night after watching your story. We were so happy that you made a trip (or several, actually) to South Africa, where they were able to hear you, imagine that? You are so humble, my man. You are going straight back to Heaven, where you came from. You will bypass Peter at the Pearly Gates, and your songs and lyrics and poems will sustain your children and their children, forever. If we had only known about you and your words earlier, this would have been a better world for sure. Please ask your girls if I can buy your music somewhere. You can buy his music on itunes, this man has touched my heart and personifies all the best of what we can be, thank you Sixto, I wish I was half the man you are. What an artist! What a singer! But, most of all, what a human being!! Humility is something so real it can’t be faked. Rodriguez has humility in bucketloads. The many stories and news articles regarding this man, all point to one thing…How gratefully humble He is. I believe Rodriguez deserves to be honoured in such a way as to highlight the struggle of common man. He never gave up, kept going and despite disappointment at “missing the boat” music wise (So he thought) He shows no bitterness. I would like to nominate This great and humble Man to receive “The Kennedy Centre honors” award for 2013. The year that He finally kicked the door down and said…..Here I am, listen to this…..
What a beautiful story this was . I cried my heart out, when I saw the story. Thank You Joyce. We must push for this honour of The “Kennedy Centre Honors” . I would love to see other artists playing Rodriguz’s songs….Amazing! WOW!!! I do believe in FAIRY TALES. 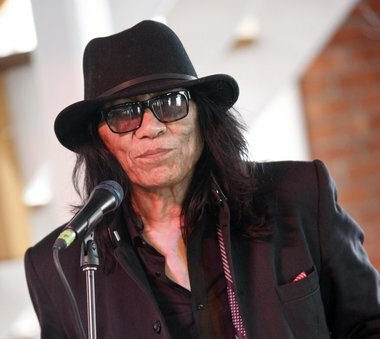 Sixto Rodriguez, a beautiful inspiration, for us all.MUSIC THAT TOUCHES THE HEART AND SOUL..GOD BLESS YOU AND YOUR FAMILY….. I LOVE THE SONG//””’I”LL SLIP AWAY… SO CATCHY AND I SING IT EVERYDAY.RODRIGUEZ YOU INSPIRE ME.. I HAVE WRITTEN A TRIBUTE…. DIDN’T REALIZE THIS SINGER’S SONGS’ WERE A MUST….!!!! But sorry AMERICA… RODRIGUEZ could never be BOUGHT!!!!…. HIS WISDOM IN LIFE, WAS PURE AND COMPLETE…. HE DID’NT NEED A TOP 40 HIT LIST. SHEET…. The TRUTH had been given, he was loved and respected in SOUTH AFRICA. THE COLD FACT, he made a DIFFERENCE… GOD BLESS YOU. always… A TRUE STAR..
i am your fan!thanks also to the people who initiated a search for the Sugarman!Next to Nick Drake and L.Cohen and few other this is something that will stay on from now on.I will pass it to my son as well who will be infected with this magic story and the cold facts he wrote and sang about!Thank you again and blessed be! I too was inspired by Sixto’s interests in community development and affordable housing preservation having devoted 37 years to this arena. From demo, rehab, retrofitting to conservation. It has truly kept my feet on the ground.